This book tells the history of Scotland between 1249 and 1371 from the Golden Age of Alexander III to Robert II, the first Stewart king. 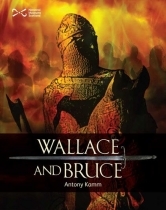 This takes in the Scottish Wars of Independence: William Wallace and the Battle of Stirling Bridge; and Robert the Bruce and the decisive Battle of Bannockburn. Find out ...Who was the 'Maid of Norway' ? How did John Balliol get his nickname? What was the 'Ragman Roll'? What does the name Wallace mean? What is the Stone of Destiny?